At the Guernsey Smile Centre we offer a wide range of dental treatments. You can find out more about these treatments below and on our fee guide. Should you have any questions about any of the services we offer at the Guernsey Smile Centre, please don’t hesitate to get in touch. Fillings: You probably have one or more (and if not, we will do everything to help you keep it that way). If you have one, but you don’t see it or feel it, that’s exactly the kind of filling we do! With modern tooth-coloured filling materials we can achieve the perfect balance between function, stability and appearance. Root Canal Treatment: When a tooth is damaged deeply either by tooth decay or trauma, it may become necessary to treat the nerve inside this tooth to prevent an infection. Root canal treatment aims to preserve the tooth so that it will not be lost: The treatment usually requires two visits, and the entire process is pain free. At the end of the treatment the root canal (where the nerve used to be) will be sealed with a root filling to prevent the entry of any infection in the future. With great care, the latest techniques and materials we can expect a long-lasting outcome. Crowns: When the working (chewing) surfaces of a tooth are severely weakened, a fracture can damage the tooth even further. In such case a filling may not be enough to stabilise the remaining substance long term, and a crown or partial crown is required to secure the tooth. Crowns are stronger than our natural tooth substance and prevent further fractures; they are usually made from a porcelain material in an individualised tooth shade and are sculptured to look very natural. Bridges: For generations a bridge has been the traditional approach to replacing a tooth: As the name implies, it bridges the gap between two teeth with a realistic-looking and functioning tooth (the pontic) which is attached to a crown on the tooth either side. A significant disadvantage of this concept is the relatively invasive treatment (preparation) of these neighbouring teeth, something we can usually avoid by opting for the alternative: an implant. Veneers: Given the possibilities of modern dental ceramic techniques and materials, a number of cosmetic flaws in our natural teeth can be corrected. Veneers can cover and thereby mask the shape and/or shade of front teeth with minimal invasiveness. Veneers preserve the natural tooth substance to a great extent as they do not require the preparation of the entire tooth as a full crown does. Tooth Whitening: Tooth shades can vary considerably, and we all want ours to be a bright and healthy shade of white. 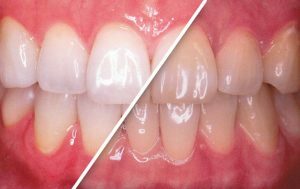 It is possible to achieve a whiter shade of a natural tooth in a safe and comfortable way by applying an active whitening gel, which the dentist can prescribe. This gel is placed in a custom-made lightweight and transparent mouth tray that fits snugly over your teeth for this gradual home whitening technique. For a kickstart with instant results we can arrange an appointment for a more powerful and monitored whitening process in the surgery, which is then followed by the home whitening system to secure and enhance these immediate whitening results. 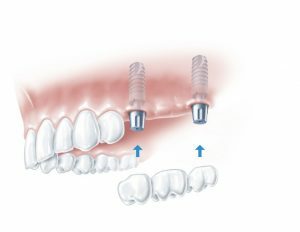 Dental implants: Dental implants are one of the great blessings of modern dentistry and allow us to replace a lost tooth without compromising adjacent teeth: They serve as substitutes for the root portion of a lost natural tooth and thereby as an anchor for a tooth replacement. This can be to replace one single or several missing teeth. In many cases a denture can be avoided by placing one or more implants. Once this artificial root, the titanium implant, has been placed, it takes three to six months for the bone to fully heal and stabilise around the implant. Then it can be loaded with a crown of a natural tooth appearance. The cost of implant treatment can be rather high, but given the advantages of implants and their superior prognosis over the usual alternatives (bridges or dentures), they usually are still the better deal over the years. 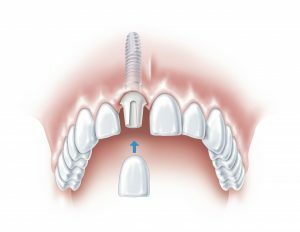 Dental implants are made by a number of manufacturers, and it is important to chose a system that is proven and well established. Not everyone is suitable for implants, and we will thoroughly assess every case individually to give our patients the best advice. Many of our patients develop a genuine interest in this fascinating part of dental technology and are quite the experts themselves by the time their treatment is completed! Extractions: We do everything in our power to help you avoid this treatment, but an extraction may become advisable if a tooth is damaged to an extent that puts you at risk. Depending on the position and shape of the tooth this may require surgical techniques and specialist expertise. As a specialist clinic for oral surgery we are best equipped for surgical extractions, including the removal of impacted wisdom teeth. The majority of these procedures are conducted under local anaesthesia, but we also cooperate with the Medical Specialist Group and the Princess Elizabeth Hospital for treatments under general anaesthesia, should this be required. Dentures: There are many different designs and concepts for dentures should a number of teeth have been lost. What these dentures all have in common is that they are a compromise, and we make it our mission to make this as small a compromise as possible: With high-tech materials and the right dental laboratory to cooperate with us, we achieve an optimum of function, appearance and comfort. Dentures can also be stabilised by implants, which hold attachments to securely click the denture into place.